There are two different versions of RTLinux: RTLinux/Pro and RTLinux/Open. RTLinux/Open is available on the web. The main (only) developer of this version was FSMLabs and stops its development in 2Q/2001. RTLinux/Pro is available for a free from FSMLabs and the license is non-GPL. This paper is focused of the RTLinux/Open version. Improving the Linux kernel preemption. Adding a new software layer beneath Linux kernel with full control of interrupts and processor key features. These two approaches are known as "preemption improvement" and "interrupt abstraction" respectively. This second approach is the one used by RTLinux. RTLinux is a small, fast operating system, following the POSIX 1003.13 "minimal realtime operating system" standard. 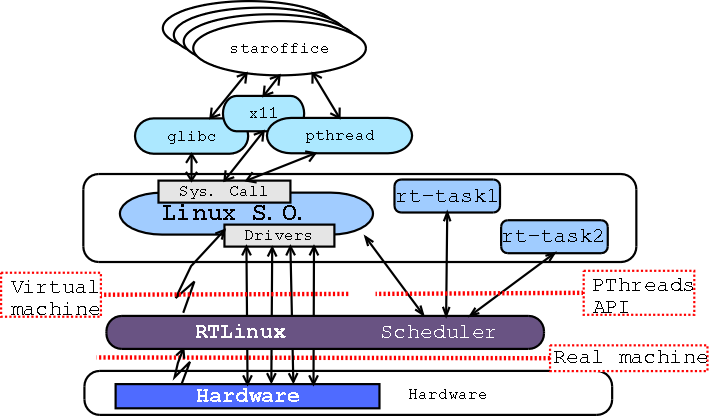 RTLinux adds a layer of virtual hardware between the standard Linux kernel and the computer hardware (see Figure 8-1). As far as the standard Linux kernel is concerned, this new layer appears to be the actual hardware. RTLinux implements a complete and predictable RTOS with no interference from the non-real-time Linux. The RTLinux threads are executed directly by a fixed-priority scheduler. The whole Linux kernel, and all the normal Linux processes, are managed by the RTLinux scheduler as the background task. This way, it is possible to have a complete general purpose operating system running on top of a small predictable RTOS. There are three main modifications done to the Linux kernel in order to virtualize the hardware so that RTLinux can take full control of the machine: The RTLinux layer takes direct control of all the hardware interrupts, interrupts that are not controlled by real-time threads are forwarded to the Linux upper level; RTLinux also takes the control of the timer hardware (8254 and APIC when available) and implements a virtual timer to Linux; and the last modification done to Linux to remove the basic control of the hardware from Linux is to replace all the cli and sti (disable and enable interrupt flag) functions calls from the Linux kernel so that Linux can no make a real disable but a virtual interrupt disable. These modifications are quiet complex and tricky, but do not require large code (Linux) modifications. RTLinux provides an execution environment "below" the Linux kernel. One consequence of this, is that realtime threads can not use Linux services because deadlock or system inconsistencies may happen. To overcome this problem, the realtime system has to be divided into two separated layers: the hard realtime layer, executed on top of RTLinux, and the soft realtime, executed as normal Linux processes. Several mechanisms (FIFO, shared memory) can be used to communicate threads in both layers. The two layer approach is a useful method to provide hard realtime while having all the features of a desktop operating system. It decouples the mechanism of the realtime kernel from the mechanism of the general purpose Linux kernel so that each system can be optimized independently.